The railroad's got to run through the town of Rock Ridge. How do you drive out the townsfolk in orderito steal their land? Send in the toughest gang you've got ... and name a new sheriff who'll last about 24 hours. But that's not really the plot of Blazing Saddles, just the pretext. Once Mel Brooks' lunatic film many call it his best gets started, logic is lost in a blizzard of gags, jokes, quips, puns, howlers, growlers and outrageous assaults upon good taste or any taste at all. Cleavon Little as the new lawman, Gene Wilder as the wacko Waco Kid, Brooks himself as a dimwitted politico and Madeline Kahn in her Marlene Dietrich send-up that earned an Academy Award nomination all give this sagebrush saga their lunatic best. And when Blazing Saddles can't contain itself at the finale, it just proves the Old West will never be the same! One might say that Mel Brooks experienced a “career year” in 1974, as the director put out two comedy classics that year. 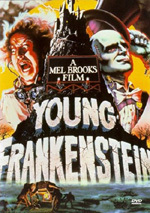 Brooks led the horror flick parody Young Frankenstein by the end of the year, and it proved to be a nice hit. However, Brooks’ first effort in 1974 became his most successful and probably best remember film. Blazing Saddles put Brooks on the map as a popular practitioner of parodies and wound up as the year’s biggest box office success. Set in 1874, Saddles introduces us to an operation to lay railroad track in the west. Taggart (Slim Pickens) supervises this operation and antagonizes black worker Bart (Cleavon Little) when he sends him to test ground for quicksand and makes no attempt to save him. As retribution, Bart whacks Taggart in the head with a shovel, which ends him up in jail and a date with the hangman. In the meantime, we meet Taggart’s boss, governor’s assistant and attorney general Hedley Lamarr (Harvey Korman). He works as the mastermind behind the railroad and he wants to make millions off the land through which the train will run. This means he needs to run out the residents of Rock Ridge so he can grab the territory. Lamarr hires goons to run rampant through town and drive off the locals, but they decide to band together and fight against them. They need a new sheriff and demand that Governor Lepetomane (Mel Brooks) send them one. Lamarr sends Bart to do the job since he thinks the locals will react poorly to a black sheriff and he’ll eventually win. Initially, he’s correct, as the folks in Rock Ridge don’t take well to Bart. His only friend comes from drunken prisoner Jim (Gene Wilder). He used to be known as the Waco Kid with the “fastest hands in the world”, but his skills are shot due to the shakes. When the folks of Rock Ridge don’t totally dismiss Bart, Taggart sends Mongo (Alex Karras) to kill the new sheriff. He fails, so Lamarr gets Lili Von Shtupp (Madeline Kahn) to seduce and abandon him. This also backfires as she becomes enamored of him. From there, Bart slowly starts to learn of Lamarr’s plot to evacuate Rock Ridge, and the rest of the film follows how things unfold. All of this culminates in a wild ending. And I do mean wild! Throughout the first two acts of Saddles, Brooks occasionally makes nods to outside influences. There’s a self-awareness that the inhabitants exist in a movie, and flippant anachronisms run rampant. However, these all feel like appetizers for the chaotic conclusion. I won’t go into detail, but the participants actually leave the movie at one point, and matters become truly - and amusingly - absurd. Brooks maintains no boundaries, as everything’s fair game. Those elements end the movie on a very high note, but the rest of the movie seems less consistent. Some delightfully ridiculous bits appear, especially when Brooks mocks the clichés of westerns. I loved Gabby Johnson (Claude Ennis Starrett Jr.) and his “authentic frontier gibberish”, and Korman makes a wonderful, moustache-twirling villain. The scene where he freaks because he doesn’t have his rubber froggie in the bath tub is terrific, and the movie features more than a few similarly funny pieces. However, too much of the movie emphasizes racially-oriented humor. We simply find too many gags that rely on consciously politically incorrect usages of the “N”-word. These feel like they try to hard to make a social point, and they rely on our shock at the use of the phrase and the attitudes to gain laughs; they lack much inherent funniness, and they date the flick. Some of the film’s raunchier elements also cause its slower spots. Its most famous scene comes from the farting by the campfire, but I’ll be damned if I can figure out why this segment earns such accolades. I thought it’d include something clever, but it’s just a long string of farts with no other dynamic involved. Fart jokes are the lowest form of humor, so stringing together a bunch of them just seems cheap and pointless. The excellent cast helps make occasionally pedestrian material more winning. I already noted that Korman brought a lot to the movie, and the other main actors also make the scenes work. Alex Karras deserves special note for a delightfully dopey turn as Mongo. A non-actor at the time, the former football star does moronic well, and Mongo’s few scenes are winners. When Blazing Saddles avoids cheap and raunchy gags and embraces the absurd, it turns into a very funny movie. This culminates in a remarkable ending. However, the film’s gags seem too scattershot for it to be a total winner. It’s generally funny, but it lacks the coherence of better Brooks flicks such The Producers or Young Frankenstein. 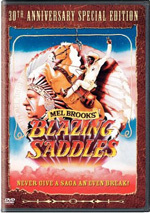 Blazing Saddles appears in an aspect ratio of approximately 2.35:1 on this single-sided, double-layered DVD; the image has been enhanced for 16X9 televisions. The transfer seemed generally satisfying, though a few more problems than I’d like popped up through the flick. The movie exhibited pretty solid sharpness. Only minor softness cropped up during the film, largely in wide shots. Instead, it looked nicely crisp and detailed most of the time. I noticed no issues related to jagged edges or moiré effects, but a little edge enhancement popped up occasionally. Print flaws seemed moderate for a film of this era. Periodic specks or bits of grit showed sometimes, and these created minor distractions. For the most part, the flick remained fairly free of defects, though they periodically became somewhat heavy. I thought the colors of Saddles looked surprisingly good. The film featured a bright palette, and the hues consistently came across as nicely vivid and dynamic. They never seemed too heavy, and they also were tight and firm. Black levels were acceptably deep and rich, while shadows seemed clean and appropriately opaque. Ultimately, Blazing Saddles looked good, though the various source defects knocked my grade down to a “B“. Blazing Saddles featured a Dolby Digital 5.1 soundtrack remixed from the original monaural source. The soundfield stayed limited in a way that reflected its origins. The best parts of the mix came from the stereo imaging for the music, which seemed nicely delineated. Otherwise, the track displayed limited ambitions. Some occasional directional dialogue appeared, and a few effects also cropped up from the sides. However, the center channel dominated. Surround usage tended toward light reinforcement of the various elements but failed to add much to the presentation. Audio quality was somewhat erratic. Speech displayed a little edginess but showed no problems related to intelligibility. For the most part, speech seemed reasonably natural, despite some distortion at times. Effects lacked much heft, but they retained acceptable fidelity and clarity, and they demonstrated no issues related to distortion. Music sounded quite strong, as the songs and score were bright and rich. They featured surprisingly positive bass response and seemed pretty dynamic considering their age. Given the movie’s age and monaural source, I thought the mix worked quite well. 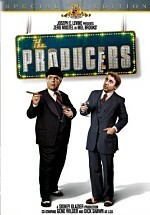 Next we head to the DVD’s extras, which start with an audio commentary from director Mel Brooks. Actually, this provides more of an audio essay from Brooks, as he chats with no direct reference to the onscreen action. It lasts for about 55 minutes and ends during “I’m Tired”. Brooks starts with the origins of the project, how he became involved in it, its writing and development, casting, various anecdotes and production comments, studio tampering and the film’s reception. Brooks discusses his state when Saddles came along well and lets us know his issues with the project, and his notes about finding a cast are very good. Things become especially interesting when we learn all the folks Brooks attempted to land for the Waco Kid role and how Wilder finagled the part for himself. We also hear cool information like the fact that Hedy Lamarr sued the production for the use of her name. Brooks’ chat might not be a full-fledged audio commentary, but it’s a brisk and informative piece that offers lots of fun notes. After this comes a retrospective documentary entitled Back In the Saddle. It lasts 28 minutes and 20 seconds and includes the standard mix of movie snippets, archival materials, and comments. We get notes from Brooks, writer Andrew Bergman, producer Michael Hertzberg, and actors Harvey Korman, Gene Wilder, and Burton Gilliam. We learn about early development and the flick’s writing, its themes and racial elements, casting, the atmosphere on the set and shooting the film, cut sequences, the campfire scene, and the movie’s legacy. A lot of the information already appears in Brooks’ commentary, but some new elements pop up here; I’d say it’s about half repeated material and half fresh. It’s good to hear from folks other than Brooks, though, and this seems like a decent examination of the movie. The best parts come from outtakes edited into the TV version; the nonsensically altered campfire scene seems especially interesting. An excerpt from a program called Intimate Portrait: Madeline Kahn appears next. This three minute and 40 second segment shows archival pieces, movie clips and comments from Brooks and actors Dom DeLuise and Lily Tomlin. Brooks repeats the story about Kahn’s audition that we hear during the commentary. Otherwise, we just get general praise for Kahn in this useless program. The DVD’s most unusual extra, we find the pilot episode for a proposed TV spin-off called Black Bart. It casts Lou Gossett in the title role and brings back none of the original cast members. It lasts 24 minutes, 25 seconds, and genuinely stinks. However, it makes for an interesting historical curiosity, and I must admit it looks great; the quality of the picture seems shockingly strong, as it presents a stronger image than the main feature! In addition to the film’s trailer, we get eight Additional Scenes that fill nine minutes, 40 seconds. Much of this material already appears in the documentary, but it’s nice to get it on its own. The segments are fun to see, though they don’t add a lot of comic treasure. Too inconsistent to really earn its status as a comedy classic, Blazing Saddles fires well at times. Many of its gags fall flat, but enough succeeds to make it generally amusing and lively. The DVD presents erratic picture and sound, though both seem relatively strong for a 30-year-old film, and the extras add a few nice components to the set. Blazing Saddles earns my recommendation.